In many situations you would want to have portable or mobile access to your RTIS™. We have put together a solution to meet those needs! 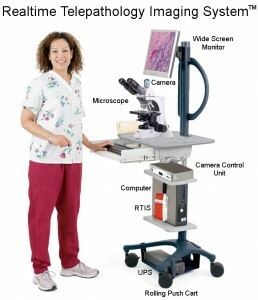 The Portable RTIS™ allows you to use your RTIS™ system wherever you need it within your practice, clinic, or hospital. Just roll the complete configuration to the point of use, connect it to the network, and begin your consultation. The system includes the mobile cart and an HD Monitor. Installation of our RTIS™ system on the cart is also available. Contact your dealer or sales representative for a quote and more info.